this article will be the first about a tank that i really enjoyed to build. maybe because it was my very first baneblade. preordered and send within time as apocalypse was released in oct.07. but than with the box in my hands i suddenly found myself unable to start building this verhicle on whichs’ release i was waiting for so long. the reason was that i had no idea how to convert it, that seemed to be worthy for such a model. further i wanted to integrate this model into my already existing army, that consisted of space wolves allied with more or less independent acting fractions of the imperial army. … so i realized that when using a physique like this, the head would become the torsos key-element. therefore it was very important that compared to the legs it it would neither become too big, nore too small. to ensure having met the perfect size, i cut the heads raw shape from foamboard and arranged it, together with the legs on my kitchentable. if you want to build a tank you need tracks. without tracks you won’t manage to build a tank running on tracks. – sounds quite logicaly, doesn’t it? and everything could be so easy, if games workshops baneblade kit would already come on movable tracks and spinning wheels. but as all of us know gws’ tanks are from being realistic and so the tracks consist of some thick plasticplates with trackstructure on their surface. so there’s no chance to use the original ones. not even, by converting them heavily. further the wheels are even worse. the baneblade i built before only got a pair of new high detailed plastic-treads but kept the old “wheels”. the result was a properly moving tank, with wheels fixed in position and the track sliding below. this was quick and easy. but now i wanted to do it better. so i decided to redesign the complete mechanism and install a spring-mounted running gear instead. i chose a pershing 1:30 kit from torro that i bought for ~30€. first of all, of course i had to cut of the structure from the original tank and replace the baneblades with it. while sorting, i recognized the sheer amount of bitz that could be used to build bigger things than normal infantry. after a short while and with the fact in mind that the apocalypse addon was released a few months before i decided to build another titan. 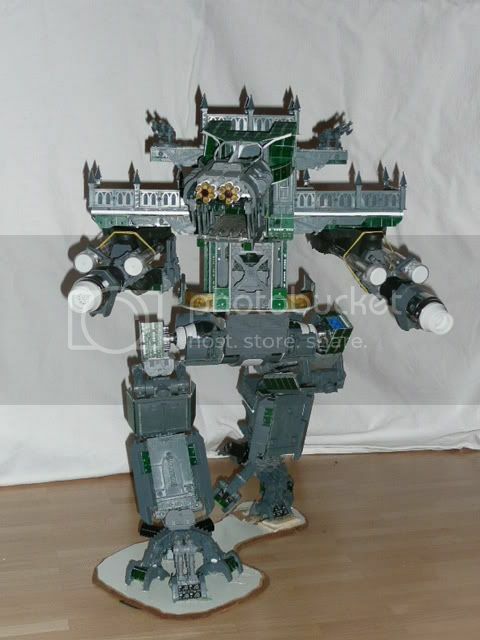 – def bigger than a warhound and maybe even bigger than a reaver, but most likely smaller than a warlord. the decission to build a shadowsword was more a practicle one, caused by the fact that i decided to integrate a real 6mm BB-gun. unfortunately the guns machanisms pure size forced me to choose one of the design without real turret on top, but with the maingun directly installed in tha tanks main body.